Many Americans are remarkably unaware and uninformed about arthritis, a disease that affects about one of every five U.S. adults. Arthritis runs under the public’s radar because it isn’t a killer like heart disease and cancer. Yet it can take a huge toll on the quality of life through the pain and problems it causes. Arthritis is often viewed as an inevitable part of growing old. But it isn’t—there are many things you can do to keep your joints healthy. May is National Arthritis Awareness Month. It isn’t aimed at people with arthritis—they’re quite aware of it already. It’s for the rest of us, some of whom are unknowingly on their way to living with this condition, and others who live with, work with, or play with folks who have it. Keep your weight in the healthy range, or moving toward it. Listen to your body; don’t ignore pain. Using non steroidal anti inflammatory drugs can be a good choice to relieve pain in arthritis. With arthritis in the lower back comes stiffness. Sometimes people with arthritis in their lower back who have sat for awhile will stand for a few seconds and then walk slowly at first because their hamstrings have stiffened and tightened, making walking difficult for the first few steps. SideEffectshub.com provides helpful and accurate consumer health information about the side effects that typically arise from the use of prescription or over the counter medications, natural or health supplements and even certain types of food. Arthritis is slow killer even if it doesn’t have the hype like other fast killing diseases.I want to agree with you that livi9ng a sedentary lifestyle could cause this disease and the best way for prevention is to exercise and walk out most often. it is a fact that many people don’t see arthritis as a disease to have fuss about.It is because it is not a life threatening disease and many don’t take time to know what causes it and its effect on their health. I’m part of those who don’t see it as a threat to life but i now know that it could have a debilitating effect on one’s overall health. Doc,can fat loss exercise deal with arthritis? Excellent post..thanks for reminding us that if we become lazy and do not respond to our body when it is trying to tell us to keep moving or it might seize up or even worse develop arthritis. Rheumatoid Arthritis is such a rehabilitating disease. What are the usual age-range for people who are prone to arthritis? I feel I had to leave a reply on the subject of weight loss. It simply isn’t possible for some people, myself included (as I am restricted to a wheelchair) to exercise. I have a heart complaint as well as RA and I find losing weight a really big deal. My MD says I can now only lose weight with a starvation diet or a stomach band. My weight has balooned since becoming confined to a wheelchair and is now very bad for my overall health. my dad has arthritis, he tried everything possible but is still suffering..are there any home remedies for arthritis? Like WarmSocks said, there are a lot of types of Arthritis nowadays, and both young and old are common victims. Your dad must have one of those chronic ones. You better ask your doctor about it, just to be sure. You should have that checked before your father gets even older. 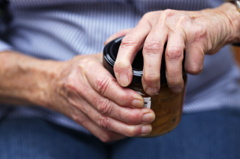 Seniors can have a lot of trouble living a normal lifestyle because of chronic arthritis. I was watching a show the other day that suggested taking an ice water bath for 5 minutes to decrease inflammation. Not my cup of tea, but for some – maybe. . .
Aren’t there nearly 100 different types of arthritis? I don’t see any mention of that in your article about arthritis awareness. Perhaps a good start on providing reliable information would be to use the full name of the disease you’re making people aware of. You’re writing about osteoarthritis. As you point out, there are some things people can do to lessen their chances of wear-and-tear damage to their joints. That’s only one type of arthritis, though. Why not use this opportunity to raise awareness about some of the other types of arthritis – the ones that keep getting overlooked? People are already pretty aware that old people can have trouble with their joints. What about the 20-year-olds and the 9-year-olds who get pretty tired of being told by teachers/employers that they’re too young to have arthritis? They could benefit greatly from your help is educating people that kids get arthritis, too. Everyone’s heard of OA; it’s the other types of arthritis that need an awareness-raising campaign. Many people tend to assume that arthritis cannot be cured and that the only possible action is to use pain relief medicines. It is important to inform them about the importance of nutrition and exercise and about the use of nutritional supplements. This is a wonderful write up, so deeply appreciated. It has been a few months since I liked a blog post so much! You got me excited and I just want to chip in a few things. What I want to add on this topic is: Well, in my opinion fat loss simply boils down to 3 main things – eat, exercise, sleep well. In summary, always eat right, sleep tight and exercise well.